Note: This same process holds true among other brokerages. For transferring shares to M1 Finance, the no-fee online broker for long-term investors, contact the transfer department in the FAQs for concierge service. M1 Finance is now 100% free. Read my M1 Finance Review here. I recently made a simple move that increased my passive income by $12 per year. This move has other positive effects on my long-term goals because it helps to simplify my finances and taxes, and will further diversify my investing through pooling dividends to buy new stocks. 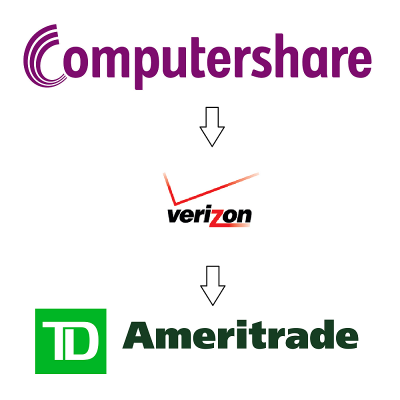 I transferred all of my Verizon (VZ) shares from Computershare to my TD Ameritrade taxable account. I held Verizon stock with Computershare for more than 10 years. Performing this transfer moves the shares out of my own name and into street name. If you are unsure what that means, I’ll explain. Back in the day when you bought shares in a company, you were issued a stock certificate. The shares were held in the investor’s name which was on the certificate. It works the same when you buy directly through a stock transfer agent, only they usually keep the certificate in safekeeping instead of mailing the paper to the investor so that you don’t have to worry about losing it. Many investors hold their shares in a brokerage account. There, shares are held in street name which makes buying and selling them easier. Investors can still opt to receive a certificate, but most do not because brokers usually charge a fee and it’s not necessary. Requesting a certificate will put the shares into the shareholders name and out of street name. You can read more about it at this link on Investopedia. What I typically refer to as DRIP accounts in my regular posts, are more accurately called Direct Stock Purchase Plans (DSPP) that have a dividend reinvestment plan (DRIP) element to them. Computershare, along with Wells Fargo Shareowner Services, Broadridge Financial, and Amstock are all popular stock transfer agents. Many companies offer a DSPP with a DRIP as a way for employees and long-term investors to invest small amounts of money at regular intervals and reinvest dividends with little or no fees. The investor relations websites for companies usually refer interested investors to their stock transfer agent’s website. You can see an example of it here on Verizon’s website. Most companies that pay a dividend have a similar informational page. Some companies allow you to open a position directly through the stock transfer agents listed above. Others require you to buy one share elsewhere before being enrolled in the DRIP. I personally own two physical certificates, one for Chevron (CVX) and the other for Coca-cola (KO). Back when I started investing in those companies, certificates were more commonly issued. My uncle gifted me a share of CVX and I’ve been dividend investing for the last 20 years. Then I acquired a share of Coca-Cola through a regular stockbroker and paid hefty fees to get enrolled in the Coca-Cola DRIP. The investment is now 20 years old (see my returns here). Today there are many better options for dollar cost averaging into stocks. My favorite is M1 Finance, a brokerage that allows unlimited buys and sells for a small monthly fee. You can set your portfolio to buy whatever stocks or ETFs you like and every time you add money to your account, M1 Finance buys the shares. Highly recommended for beginners to intermediate investors. Great mobile app. You may have read some debate on dividend growth blogs over whether to reinvest dividends into a company or to pool funds and buy shares of another company. I previously reinvested my dividends for all the DRIPs I owned. But I’ve since started pooling funds in my main brokerage account to reinvest into undervalued stocks. For Verizon, I reinvested my dividends for years. I wrote extensively about this in a post called 10 Year Anniversary of Buying and Holding Verizon. In that post you can look at a spreadsheet with the historical data regarding each and every buy and dividend reinvestment. After slowly building my position to 194 shares, I was receiving $109.21 per quarter in dividends and $438.44 annually in 2014. In 2017, those same 194 shares paid me $114.56 or 457.84 annually thanks to dividend growth. Instead of reinvesting the dividends, I want to put that money into new stocks to diversify my portfolio. Verizon is already a large percentage holding in my portfolio. While I still like the business, they have made some big debt moves recently, so it is prudent to further diversify into other stocks. Verizon is the first stock that I transferred out of Computershare. I followed it by transferring Emerson (EMR), Coca-Cola, Chevron, Aqua America, Procter & Gamble, and Bank of America (BAC). Another big motivator for transferring shares was the cost of reinvesting dividends. Verizon charged me $3.00 per quarter to reinvest the dividends. These kinds of fees are common with DRIPs and often change over time. But some companies pay the fee for you. Coca-cola charges $2.00, and Chevron only charges a few cents at the moment. Aqua America on the other hand, actually discounts the price of their stock 5% if you reinvest your dividends in DRIP. All the plans are different so you need to keep up with the fee schedules. When I did my taxes this year I had a number of Forms 1099-DIV’s to contend with. For every DRIP I participate in, I get a separate 1099-DIV. With a brokerage account, you get one consolidated 1099-DIV, making the dividend input for taxes much simpler. This helps to simplify my finances over the long-term. Lastly, I can calculate my cost basis now and enter that into TD Ameritrade. Going forward, I don’t have to be as meticulous tracking it every time I make a transaction. A downside of moving my shares to TD Ameritrade is that I can no longer invest small amounts of new capital at a low cost. I now do that at M1 Finance. Also, dividend reinvestment is not built into the TD Ameritrade platform. TD Ameritrade offers the service for free, but it takes a phone call to set up and there are limitations. Since I am not looking to add any new capital to Verizon any time soon and I want to pool my dividends, I’m not concerned with either downside. The transfer went very smoothly. I was a little bit apprehensive about the administration of the move, but it was quick and easy. Coincidentally, a local representative from TD Ameritrade called me to ask if I had any questions about my account right around the time I was thinking about the transfer. He said TD Ameritrade would gladly bring the shares into my account with them and he emailed me the form to use. He also said if Computershare charged me a fee to make the move, TD Ameritrade would refund up to $75 to cover the expense. I filled out the form and specified that I only wanted the Verizon shares to be moved. Only whole shares could be moved. So whatever fractions of shares I had left in Computershare would stay until I sold them. This worked out perfectly since my balance was 194.046212 shares. 194 shares would go to TD Ameritrade and 0.046212 would stay at Computershare. When I sell the last fraction of shares, I’ll net just $2.25, so that will be the cost to close out the account. If I do this in the future with other holdings, this is important to keep in mind. Computershare did not charge me any other fees. If you are ever considering moving money around to different accounts, it is almost always best to initiate the transfer from the receiving party. Why? Because it’s a competitive world and brokerages want your money badly. They’ll move it as fast as possible and gladly answer any questions along the way. For me, the transfer took less than a week once I mailed the form. My shares showed up in my TD Ameritrade account and were removed from Computershare overnight. I sold the remaining .046212 shares in Computershare last week. Next year at tax time I’ll have one final 1099-DIV from Verizon. From then on, the Verizon dividend tax information will be included in the TD Ameritrade consolidated 1099-DIV. I’ve initiated five or six of these transfers now. I’m finding that more often than not, the cost basis is not transferred correctly. So I must strongly recommend that you verify cost basis every time you transfer DRIPs into another brokerage. Transfer agents were not required to record cost basis prior to January 2011. Before then, the investor was on his/her own. If you started a DRIP after December 2010, the transferring company (i.e. Computershare), should make available the cost basis for every single stock and dividend purchase. In addition, the receiving brokerage (TD Ameritrade in my case), needs to import the cost basis data. More than half of the transfers I’ve complete, the cost basis was messed up. Most recently, Procter & Gamble (PG). These shares were transferred to Wells Fargo because of a plan switch, and when I moved them to TD Ameritrade, none of the cost basis was transferred. I had to use the records from Computershare and my own spreadsheet and email the numbers to TD. For Emerson Electric (EMR), only the shares I purchased after December 2010 were transferred. So I needed to contact TD with the numbers for shares I bought prior to January 2011. This has been a bit of a hassle. Catepillar, and Clorox, on the other hand, transferred OK. CSX, which I transferred out of Broadridge (which started in Computershare), transferred some of the cost basis, not all. As easy as the process it, and according to how the law has been explained to be, the brokers should not be screwing this up. But they are. The consequences are if you go to sell a stock and the cost basis is zero or lower than your actual cost basis, you’ll pay taxes on the entire proceeds! Please make sure you verify cost basis every time. Your broker should be there to help fix any mistakes. TD Ameritrade has been pretty good on this, aside for some fat fingered input on occasion. Have you had any good or bad experiences transferring stocks recently? This was a timely, informative posting as a stock I DRIP is moving headquarters into the UK, where we were told ‘somewhere’ in the future we might have to pay up to 1% in stamp tax upon transfers. I had emailed Fidelity, where I have a brokerage account, and their transfer method from Wells Fargo seems similar to your experience. I hadn’t ‘bit the bullet’ yet, but now that I’ve read this, will today. There was one difference, Fidelity said they would also transfer the fractional shares of this account. That’s interesting that Fidelity will take the fractional shares. From speaking to Computershare I learned it was on their end, not TD. So maybe Wells Fargo is ok with it while Computershare is not. Thanks for your comment. Funny, today when I looked further into initiating a broker transfer, Fidelity’s website says I cannot move the fractional shares. Not surprised, but makes me wonder about their Cust. Service reps capabilities. Anyway, the reason I am replying to you is to ask, did Computershare chare a fee to allow you to move your shares to another broker? Just wondering if it is worth the change. Thx. Computershare did not charge a few. But I could not transfer fractional shares, so I had to sell the fractional balance. They charge the normal fee on that sale. I only had .02 shares leftover, so my proceeds were below the sell cost ($15 I think). They took the proceeds which was about $2, and nothing more. The transfer was definitely worth it for me. Thank you for the prompt reply. I started out investing with all DRIP’s, but I am getting to the point where I have more money to invest and like the ability to name my ‘limit’ when buying shares through a discount broker. I will start by moving one stock, and see how it goes. Thanks again. Similar situation for me. I like the drips until it’s a full position. I don’t like paying fees on the reinvestment and want to consolidate. Figured i’d try one stock to see how it goes. Went very smoothly. I’m glad that went smoothly for you. I only have one company in a DSPP/DRIP with Computershare, gifted the shares from my grandfather back in middle school. Being able to transfer the shares was one of my concerns with starting up some of the DSPP to slowly DCA into positions. Glad to hear it was fairly easy/straightforward and I’ll have to look into some more DSPP’s now because I really like the slow DCA approach for core holdings since every single month you’re building up your position and forward income. I was surprised about how smooth it went. And the assurance from my broker that they would cover fees was good too. I started this Drip many years ago when I wasn’t as concerned about fees. Moving this one was overdue, and now I want to get on it for other holdings. Awesome you received a gift from your Grandfather. Glad he is feeling better. Gifting shares is something I want to address more in the future. I had no idea about street name and shareholder name. You learn something everyday! I recently moved brokerage accounts from Scotia Itrade to TD web broker. I had some shares transfer over and total time it took was about 5 days for everything to show up correctly. I took advantage of a new promotion with TD that offered free switching fee and 300 free trades and I made the jump since TD was my main baking account. Couldn’t of been happier so far ! Makes sense to shop around cause their are great promotions at brokerages that want your money. One could possibly switch brokerages every year to capitalize on this! Good day and Grind on big daddy! Man, I need a tag line like that, grind on big daddy, I like it! It’s a great idea to try to score some free trades out of a transfer. I didn’t think of that. My transfer was under 10k, but maybe I could have gotten some trades out of it. I’ll look into that for my next transfer. Retire On! (Not as cool). Why don’t you choose a broker like Sharebuilder to do the other DRIPs so you can continue to do the small fractional investments? I already have a TD Ameritrade account and I’ve been happy with them. The do provide DRIPs, but the stocks I own there I do not intend to DRIP. Sharebuilder does seem like a good place to invest. Low cost too. Good info on the transfer. One question. CS usually charges $15 for a batch or $25 for a market order to sell shares, but if I understand this correctly it will not charge it if you ‘don’t have the money’ so to speak. So CS kept the money after selling the fractional share, but at least you were not charged $15, correct? That’s a good piece of info to keep in mind when I am ready to do this. I wish to build full positions first and then start the process by consolidating under one or two brokerage accounts that allow ‘trust’ type accounts. Yes exactly. I called before I did the move and the rep said if my batch sale proceeds were less than $15, there was no charge. I had 0.04 shares leftover and I think that was worth about $2 after the sale. They kept the $2 and called it even. So yeah, is going to impact future transfers. I’ll wait until the fraction is low and do the sell then. One thing to consider before selling/moving your DRIPs from the transfer agent – you can pass on “starter” shares (1 share) to people as a way to “pay it forward” and also make a bit of money in the process! There are those (such as I) who will gladly buy them to start their positions with 1 share, and it’s a win-win because we get to start by only buying 1 share (as opposed to having to spend hundreds of dollars) and you usually get paid a customary amount of $10 per starter share you pass on. There are actually a few of us out there that buy these shares held directly, so you may be able to liquidate your *entire* position if you have just a few shares, and save yourself the selling commission on a brokerage as well. You can also email me at enrichliving at me dot com if you have specific questions about the process (I have assisted many). I was thinking of doing the same thing, but I wasn’t sure exactly how to do it. I have DRIP accounts with 4 different agents. And a scottrade account that holds JNJ. Computershare is the bulk of it, and the other three I purchase directly from the company, i.e. 2 utility companies and Aflac insurance. I’d like to get it all with my Scottrade account, now that they have the FRIP program. My only issue is that you can’t make little optional purchases per month which I tend to do every month, with the various equities that I have. My concern is the cost-basis issue. The utility companies I’ve had for over 10 years, and the Computershare holdings are closing in on 5 years. Are the fractional shares subject to the cost basis issue? It they are, then this could be a nightmare trying to compute it; since Scottrade does not accept fractional shares. I thought about Sharebuilder as well, and they do accept fractional shares. However, there are fees associated with it, if you want to continue “dripping”; which is currently $20 per month for 20 equties, and $3 additional for each one. How I understand it is you figure out your cost basis based on your data from Computershare, then report that to you new broker. That is how it works for TD Ameritrade. I haven’t informed them my cost basis yet. Remember, prior to January 2011 they didn’t have to report it to the IRS. You’ll only be able to transfer whole shares. Then sell the fractional through Computershare or whatever agent you use. Computershare should report the cost basis of those fraction shares sold (the lower the better). Mine, I only got $2 from the sale, and that went to the batch sale fee. So my proceeds were $0. In that case I shouldn’t have much to report. The whole shares went to TD and I have a cost basis for those shares. For shares prior to January 2011, get as close as possible to an accurate cost basis. As long as you are honest, and have documentation on how you calculated your CB, and its reasonable, the IRS isn’t going to look closely at it. Unless your income is very high (at least $200,000) and you have other shady dealings in your return, you won’t get an audit. The whole point of the law that required cost basis reporting by the brokers was to make it easier for investors, more accurate, and to increase tax payments to the government. Do your best with cost basis, be honest, and don’t worry too much about it. As always, contact a CPA for professional advice! thanks rbd. Having one brokerage account to handle everything will make it loads easier during tax time. Plus, it’s always gratifying to see my account balance all in one place, instead of logging into 5 different websites. The main reason I am interested in transferring my shares in CS drip plans to a broker is because of the uncertainty surrounding the sale price, since for example if you sell a market order of shares using Computershare, your actual transaction will not be processed until days later thus potentially costing you when equities become volatile. Yeah that is an issue. Depends on the volatility of the stock and how many shares you own. If I owned only a small amount, I wouldn’t go through the hassle of transferring them. But, if the amount is $5000-$10000 or more, it probably makes to do the transfer first. If you’ve lost the physical shares, I believe there’s a way to get new ones reissued, for a cost. I also know if you own physical shares(and know where the my are), you can turn them in for safe keeping (for a fee again and after motorized) at Computershare. So having lost shares certificates, my guess is you’d have to take care of that first. I’d call CS and see what they say. I know it’s probably hard to get a person to speak to, but lost shares is probably a common problem. Were there any costs to transfer from Computershare to TD Ameritrade? I tried doing it with OptionsHouse and they wanted to charge me a $125 fee, which wouldn’t have been worth it for me. I was charged zero in fees from Computershare. TD said they would have covered the fees for me, up to a certain amount. The only thing similar to a fee was selling the remaining fraction of a share. Hope that helps. I don’t know why option house would charge you a fee to bring assets to them. Seems anti-customer. Retire Before Dad, didn’t you need to use the Computershare Transfer form to transfer shares out of computershare? Are you saying the only form you used was from the receiving broker?? Yes. From what I can tell, the Computershare transfer wizard is to transfer shares to another person. Like a gift. I’ve transferred shares for about 6 different companies now. For each, I never contacted Computershare or Wells Fargo or Broadridge. Each time I initiated the transfer through my broker. Filled out the form on my broker’s site, mailed it to them, and a week or so later, the shares were in my account. I have had some issues with cost basis getting transferred. I need to add a section on the cost basis aspect because it can be a headache. If you leave the fractional shares in CS will they still send a 1099 if reinvestment earnings for the year are under $15? Could you just leave the fractional shares in CS and not sell them so you don’t have to report a cost basis and since earnings will be nil, no 1099 will be generated? In general, I believe the limit for receiving a form 1099-DIV and paying tax is $10. Below that, it does not need to be reported. You could leave the fractional shares, yes. But I prefer a clean break. When I transfer shares out, part of the reason is to clean up the account. So I sell and close the account for good. I used to hold shares at Computershare. I found them to be deliberately obtuse whenever I wanted to do something, anything, with my account(s). I no longer have any holdings with them or any other transfer agent. I utilize two brokerages, Fidelity and Capital One Investing (ShareBuilder). ShareBuilder is great because I can invest small amounts weekly, twice monthly, monthly, or whenever there’s enough cash in the account to invest. The cost is quite low as well. Most of our portfolio is held with Fidelity (my IRA, both of our Roth IRAs, and a joint taxable account). I have negotiated the trade costs with them down to $6.95/trade, and it’s even lower at ShareBuilder. Fidelity allows me to DRIP my dividends back into the shares I choose, or get deposited to my core cash position in each account. THEY DO NOT CHARGE FOR THIS. I would NEVER pay to have my dividends reinvested, as I think it’s absurd. AAMOF, several of our holdings participate in a DTC discount plan which means the dividends are reinvested at a discount between 0-5%, ALL AT NO CHARGE.